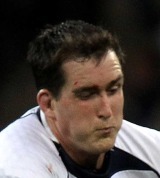 Devin Toner is a second-row who plays for Leinster. Toner went to Castleknock College in Dublin before becoming a professional with Leinster, making his debut in 2005. The second-row is the tallest player in the Heineken Cup at 6ft 11in. He played three times for Ireland A in 2009 before being named in Ireland's starting XV to win his first cap against Samoa in November 2010.